There is also a join() method is added into String class to convert an array of String or a list of String joined by a delimiter of your choice. 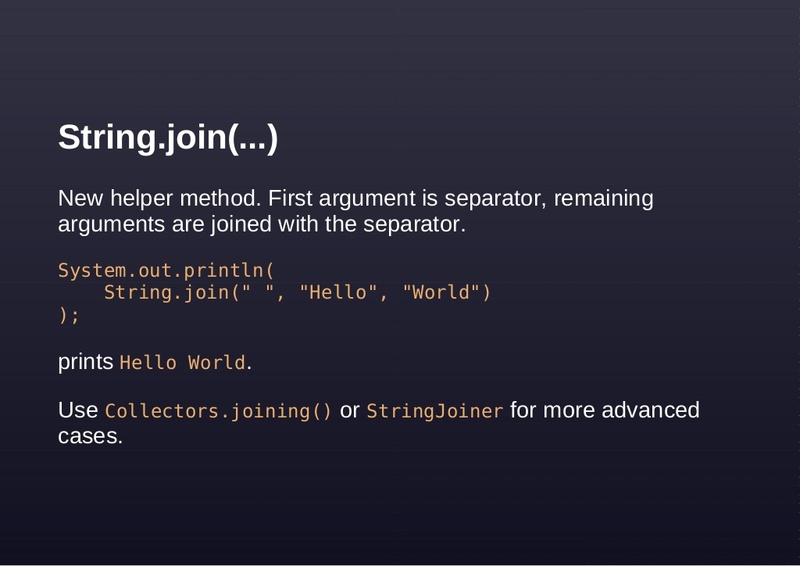 In this article, we'll see a couple of examples of joining String in Java 8, which will teach you how to use both StringJoiner and String.join() methods. 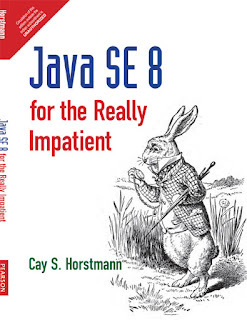 Btw, if you are keen to learn new features of Java 8 apart from major attraction like lambda expression and date and time API, then see the Java SE 8 for Really Impatient book by Cay S. Horstmann. He has explained miscellaneous enhancement done in Java 8 with the brief summary and useful examples, which is very handy for a busy Java programmer. The JDK 8 has added another text utility class called StringJoiner in java.util package. This class allows you to join arbitrary String by a delimiter. It also allows you to add a prefix or suffix by providing overloaded constructors. Some programmer might confuse between StringJoiner and StringBuilder or StringBuffer, but there is a big difference between them. StringBuider provides append() method but StringJoiner provides join() method. The append() method doesn't know that you don't need to add delimiter after the last element but join() does. So you don't need to handle either first or last element in joining loop anymore. From these examples, you can see how easy it has become to join multiple String in Java 8. You can also see Java SE 8 for Really Impatient to learn more about StringJoiner class. JDK 8 also added a convenient join() method on java.lang.String class to join Strings. This method internally uses StringJoiner class for joining Strings. There are two overloaded versions of join() method, one which accepts CharSequence elements as variable arguments, so you can pass as many String, StringBuffer, or StringBuilder as you want. This is used to join any number of arbitrary String as it accepts individual String as a variable argument, so you can pass as many String as you want. The second version of join() accepts a CharSequence delimiter and Iterable of CharSequence, which means you can use this to join a list of String or an array of String in Java. Here is an example of joining any arbitrary number of String using String.join() method. The second argument is variable arguments which mean you can pass any number of String as you want. You can see that we have combined three String by space by using String.join() method, no loop was required. Now, let's see how we can join all String elements from an array in Java. If you remember, prior to Java 8 we have to loop through array and use a StringBuilder to append all elements into one and then finally convert that to String using toString() method. Now, you don't need all that, just pass the array and a delimiter of your choice to String.join() method and it will do that for you. You can see that all three elements of the array are joined together and separated by the delimiter which was semi-colon in our case. Joining all elements of a list in Java is not very different than joining elements from an array. You can pass not just a List but any Collection class unless its implementing Iterable interface. Same String.join() method is used to combine elements of List as it was used for array in previous example. You can see the result is a long String containing all elements of given List and each element is separated by a comma, the delimiter we have passed. JDK 8 also provides a joining Collector, which you can use to join String from a Stream as shown below. You can see that all elements from the Stream are combined using comma as instructed to joining Collector. 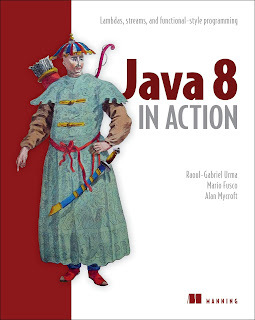 See Java 8 in Action to learn more about Streams and Collectors in JDK 8. Well, there is no built-in join() method on Java version prior to Java 8, so you need to write your own or you can use third party library like Google Guava or Apache commons and their StringUtils class to join String. Alternatively, you can use this method to join String in Java 7 and earlier version. You can pass this method a List of String and a delimiter of your choice, it will return a String where elements of a list are joined by given delimiter. Here is our complete sample Java program to demonstrate how you can use both StringJoiner and String.join() method to join multiple String objects by a separator. // You can use this to create path in file system e.g. That's all about how to join String in Java 8. You can see with the introduction of StringJoiner and addition of String.join() method joining String has become very easy in Java 8. Though, if you are not running on JDK 8 yet then you can use the utility method join() I have shared in this article. It uses StringBuilder to join String from array and list. @Anonymous, thanks, Glad that you like this article. 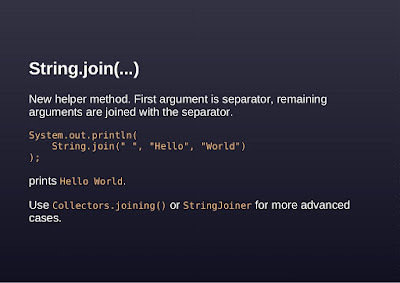 StringJoiner provides add() method, join method is in String class.